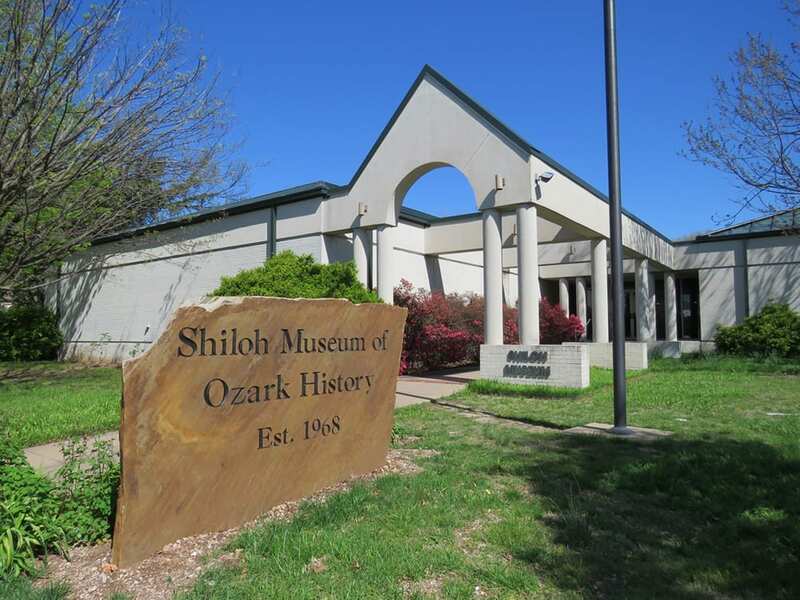 The Shiloh Museum began in 1965 with the City of Springdale’s purchase of a significant collection of Native American artifacts gathered over the course of sixty years by Springdale resident Guy Howard. The collection contained some 10,000 prehistoric and historic artifacts and 260 books and pamphlets on anthropology and archeology. City officials moved the collection into a vacant building. With guidance from the University of Arkansas Museum staff, volunteers interested in archaeology identified, classified, and cataloged the objects. The City soon hired an amateur archeologist on a part-time basis and appointed a board of trustees to organize a museum. The first bylaws were approved in May 1968. The old Springdale Public Library building was chosen as the museum’s first home. On September 7, 1968, the Shiloh Museum opened to the public. The name “Shiloh” was chosen to honor the settlement and church established in the 1840s on the site of present-day Springdale. As stated in the museum’s original bylaws, the principal purposes of the Shiloh Museum were to acquire and display items of historical value and to encourage and promote historical and cultural interest in the Springdale area. In the years ahead, the museum’s field of interest expanded beyond Springdale to include more and more of the Ozark region. The museum grew slowly through the 1970s. In 1980, an enlarged board became more active, and a full-time professional director was hired. Thereafter, several innovations made the museum more visible: new educational programs (including a lecture series, crafts workshops, and tours for school classes); an aggressive exhibit scheme; and a series of successful grant proposals. Seven federal grants during the 1980s were of significant help to the museum, increasing its prestige and aiding it in growing the staff and increasing services. One special program funded by federal grants was the “Vanishing Northwest Arkansas” photo collection project. By 1993, that project had resulted in a collection of over 100,000 images and, as a result, earned an Award of Merit from the American Association for State and Local History. In the early 1980s, property adjoining the museum was acquired by purchase and bequest, and the museum reached its present boundaries: a city block of two acres (which includes the historical town square of the community). In the 1980s, four historical buildings (1850s log cabin, 1870s general store, 1870s country doctor’s office, and 1930s outhouse) were moved onto the property and arranged along an appropriate axis, taking advantage of interesting changes in elevations and complementing an 1870s (remodeled in 1938) home already on the property. The entire site is enriched by some of the oldest trees in the city. In 1991, after five years of fund raising and construction, the museum moved into a new 22,000 sq. ft. ($1.1 million) building. 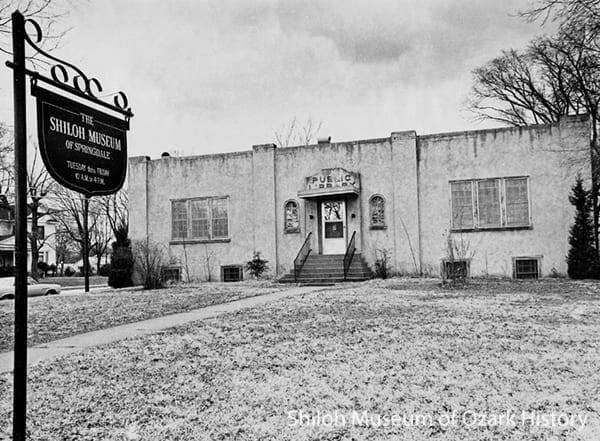 In 1993, the board changed the name to “Shiloh Museum of Ozark History” in order to more clearly define its scope for potential visitors. In 1995, a 1930s barn with attached sheds (for our antique farm machinery) was moved onto the site. In 2005, the New Era Lodge #36 of the Independent Order of Odd Fellows donated their meeting hall, originally the historic Shiloh Primitive Baptist Church, to the museum. The two-story frame building, now known as the Shiloh Meeting Hall, is located one block north of the museum’s main campus. The City of Springdale remains the museum’s main source of financial support, but approximately two-thirds of the members, visitors, and participants in programs live outside Springdale. The museum reaches out to other cities and counties through its collection policy and through its exhibits, programs, and research facilities.